The opening weekend is here. Okay, 2018 saw the reintroduction of the Kapelmuur/Bosberg finale, but this led to some boring racing, especially with the headwind we had on the day. The organisers have made the bold move of immediately changing the route, in order to encourage more attacks before the big finale. The main alteration comes after the final ascent of Berendries. Instead of heading South to the Valkenberg and Tenbosse, the peloton will stay on narrow roads and take in the climb of Elverenberg-Vossenhol. This means that we now only have 18km between the Leberg and Kapelmuur, instead of 26km. This is an interesting change and it’s good to see the organisers admitting the previous route didn’t really work. The shorter gap and narrow roads will encourage attacking riding and a selection should be made before the Muur. 133.9km Valkenberg 540m at 8.1%. 145.2km Wolvenberg 645m at 7.9%. 145.4km Ruiterstraat 800m of cobbles. Narrow as hell! 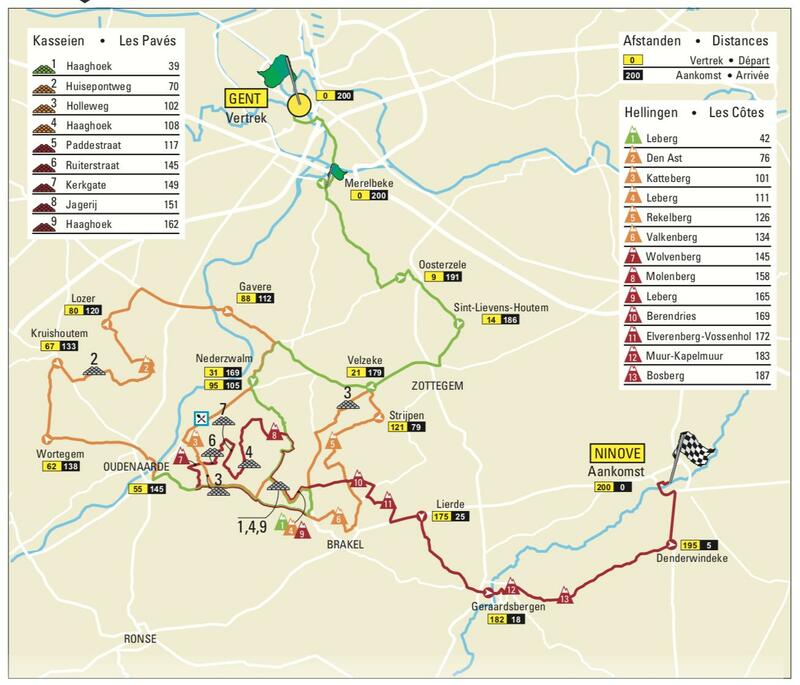 148.6km Kerkgate 1030m of cobbles. 151.2km Jagerij 800m of cobbles. 157.5km Molenberg 463m at 7%. 162km Haaghoek 2000m of cobbles. 165km Leberg 950m at 4.2%. 169km Berendries 940m, at 7%. 171.5km Elverenberg – Vossenhol 1268m at 3.6%. 183.3km Muur – Kapelmuur 475m at 9.3%. 187.2km Bosberg 980m at 5.8%. Where will the selections be made? The million-dollar question! I think this year will see the race split before the Muur, the route has been made that way. The most important section of the race will be the Haaghoek, leading into the Leberg and Berendries, this is when the elastic will snap. With lots of riders already in brilliant form, I think we’re in for a cracking race. I can’t remember the last time we arrived here with so many of the contenders already with wins under their belt, it really could be a bumper edition of the race. The other aspect we always have to consider in these races is the likelihood of crashes. With the narrow roads used, crashes are always to be expected and this can have a massive impact on the racing. Given the current form of Matteo Trentin, I think we’ll see most teams wanting an attacking race. The Italian is currently riding very well and is likely to make the selection on the Muur, this has to force teams into attacking early and putting Mitchelton-Scott under pressure. They don’t have the depth that others have, which is another reason why teams will want to attack early. Expect to see QuickStep, CCC, Lotto and Trek wanting a fast race. There is a threat of rain for the whole. The wind is quite strong and coming from the West, which means a tailwind or cross/tailwind for the majority of the day. Get ready for some splits over the top of the climbs. QuickStep – as always, the Belgians arrive with an embarrassment of riches. Already this season we’ve seen Gilbert, Jungels and Stybar taking wins, but also strong performances by Lampaert and Declercq. They might not have Terpstra anymore, but they have four riders who could potentially win, that is huge. They don’t have the best relationship with this race, but I don’t think that means much. As they are unlikely to win a sprint which features Trentin or Colbrelli, they must ride an attacking race. They will try to split the race before the Muur, if they don’t succeed, they will go again on the legendary climb. If the race is still together, they’ll try again on the Bosberg. Basically, they will keep trying until they split the race, or run out of gas. It’s the QuickStep way! Trek Segafredo – this is their strongest classics squad in a long time. With Stuyven Theuns, Pedersen and Kirsch I have high hopes for the Trek boys. Unlike many of their rivals, they don’t arrive with any results yet in 2019, something they’ll be eager to change. Stuyven enjoyed a ridiculously consistent 2018, with top 10 results in Nieuwsblad, Milan-Sanremo, E3, Gent-Wevelgem, DDV, Flanders and Roubaix. He then returned in the Autumn with a stage win in the Binck Bank Tour, 2nd place in Brussels, 3rd in Québec, 1st in GP Wallonie and GP Jef Scherens. What a season! Pedersen made significant progress too, taking 2nd place in Flanders. I’m very happy to see Theuns return to the team, they were always a good fit. I think we’ve still to see the best of Eddie, a rider I have a huge amount of time for. With this type of team, they have to be involved in the finale of the race. Lotto Soudal – they have two main options in Benoot and Wellens, with Keukeleire a reliable back-up. Wellens was very attacking here in 2018, but burned himself out by attacking at the wrong points. Benoot also made the wrong move and ended up eating lots of headwind on the approach to the Muur. They got their act together for the next series of races with Benoot wining Strade Bianche and also finishing 7th in DDV, 8th in Flanders and 3rd in De Brabantse Pijl. The squad will be very keen on improving their Belgian results, especially in the opening weekend. In Wellens and Benoot they have two of the strongest riders in the race, they just need to get their tactics right. Greg Van Avermaet – took an early win in Valenciana and followed that up with some strong performances in Oman, netting a 2nd and 3rd place. A lot were worried when he changed teams, but CCC have put together a strong group of riders to support Greg deep into the race. They are strong and will attack the race early and hope to drop all the domestiques and leave this as a battle between the favourites. It will then be over to him to deliver the goods. GVA didn’t manage to win any of his target races in 2018, but he still managed to wear the yellow jersey for 7 days. Saying that, he will be desperate to win one of his home races this year. Oli Naesen – 2018 was a series of unfortunate events. Bad luck, crashes and injury took its toll on the former Belgian champion and ruined his classics campaign. He put it all behind him towards the end of the season, taking another win in Plouay and he finished in the top 10 in his final 5 races. 2019 has started well with him exceeding expectations in Oman. AG2R decided against strengthening their classics team over the Winter, this is a mistake in my opinion. Other teams have improved, AG2R have stayed still. This doesn’t mean Oli can’t win, he’s a bloody strong rider. Matteo Trentin – he already has 3 wins in 2019, that’s more wins than the whole of 2018. The Italian looks in superb form, he’s not just sprinting well, but he’s climbing better than ever. He represents a significant challenge to the other contenders, they know they can’t outsprint, that means they need to drop him. This is going to make life very difficult for Trentin, he could really do with help from Durbridge, Smith and Edmondson. I know what you’re thinking, that looks a little weak. What will Trentin do when the big boys go full gas early in the finale? Can he climb with the best on the Muur? Can he hold the race together in the final 10km? Lots of questions for the Italian to answer. Sep Vanmarcke – registered his first win in two and a half years in Haut Var, a big result for the man who struggles to win. Sep won a reduced bunch sprint not long after a 5km climb at 5%, he wouldn’t have made it over the climb in previous years. This tells us that his legs are very strong just now, with a little bit of confidence, the sky’s the limit! Sep was the rider who was fastest up the Muur in 2018, if he repeats that this year, could he go on and win the race? 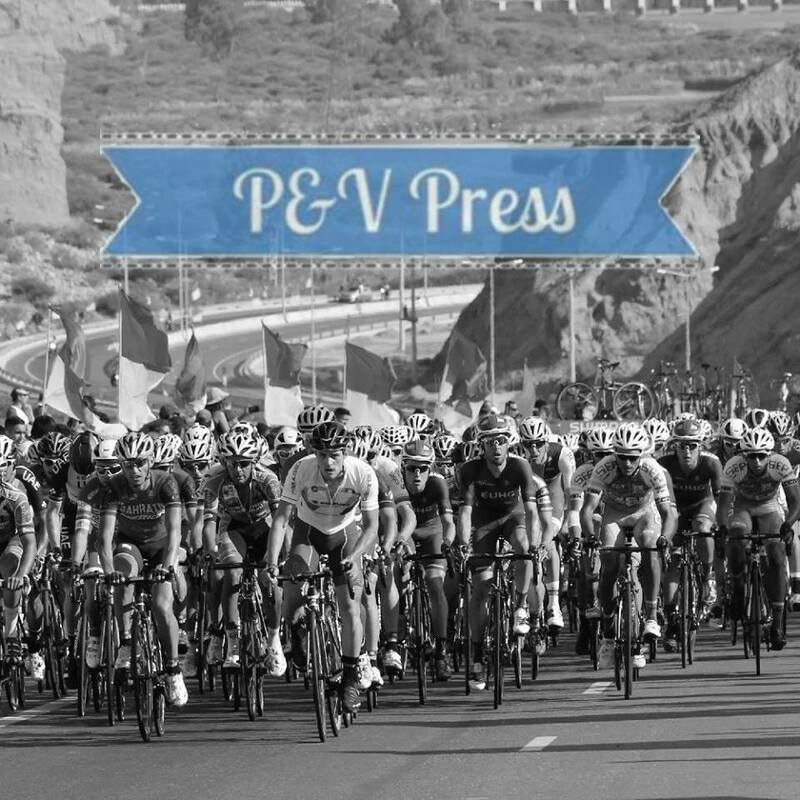 Michael Valgren – the defending champion, I love writing that! After a huge year in 2018, where he won Nieuwsblad and Amstel, I’m looking forward to seeing how he progresses in 2019. His new team have brought some experience to help him, especially Boasson Hagen and Lars Bak, but I fear he’ll be all alone in the closing kilometres. Valgren is a clever boy, he knows that he’s now a marked man and he’ll need to do something a little different in 2019. He has all the power in the world and the cycling brain to match, just you wait for 2019! Alexey Lutsenko – crazy strong! Astana were the best team in this race back in 2018, placing three riders in the front selection. Now that Valgren and Gatto have left, who will step up and fill the void? The most likely is Magnus Cort, a rider who made significant improvement in 2018. Even if Cort can’t quite step up to this level, Lutsenko’s current form is so good that he might not need any help. Wout Van Aert – after a strong road campaign in 2018, we’re all excited to see what he can do with a strong team behind him. With Roosen and Teunissen at his side, the sky is the limit for the cycle-cross superstar. Given the flat finish, I’m not sure how he wins this race, but he should be challenging. His sprint is fast, but not as quick as some of his main rivals. Michael Matthews – I’m not a fan of his route into this race. The Aussie heads off to altitude and makes this his first racing of the year. For me, it’s not the best approach. Niki Terpstra – can he win a big race riding for Direct Energie? Possibly, just not this one. Watch my video preview with Edward Theuns of Trek-Segafredo. If you like that you’ll love my podcast. The new episode is now online, the day I won Strade Bianche with Tiesj Benoot. Go give it a listen. It’s hard to see past the boys from Deceuninck – Quick Step. With Gilbert, Stybar and Lampaert they have trio who will be very hard to beat. They will make the race attacking and it will split before the Muur. Given his start to the season, I expect Philippe Gilbert to take a third title. Right team, wrong rider. Stybar is due this year?! But did GVA underestimate Stybar by covering the attack himself? Stybar looked the strongest of the others, so stay on his wheel? Now GVA knows what it’s like to be Sagan.